The FBI are reportedly now looking into why the 16 charges made against Jussie Smollett were dropped. Empire actor Jussie was charged with 16 count indictment for filing a false police report in the investigation into his attack in Chicago at the end of January. He initially reported the attack as a hate crime, telling police he endured racial and homophobic abuse by two masked attackers, but was later accused of ‘orchestrating’ the attack himself; allegations Jussie has continuously denied. The charges were dropped against Jussie and he described the last few weeks while the investigation played out as the ‘worst time of his life’. However, there has been some backlash following the court’s decision and new reports suggest the FBI have now launched a probe into why the charges were dropped when the prosecution team claimed to have evidence for Jussie’s conviction. 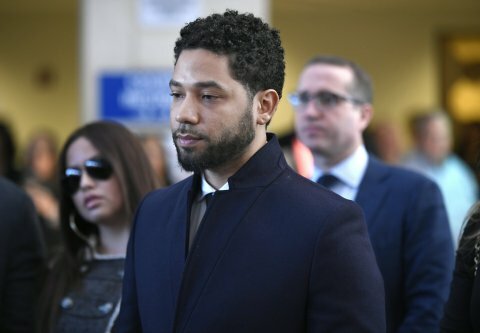 Page Six reports the FBI’s investigation comes after State’s Attorney Kim Foxx claimed the charges against Jussie being dropped was a ‘just outcome’ even though the prosecution ‘could prove him guilty’. TMZ reports that the Cook County State’s Attorney is now asking prosecutors for other examples where felony charges were dropped like they have been in Jussie’s case. Jussie’s attorney, Patricia Holmes, responded to the reports, telling the publication: ‘The case is closed. No public official has the right to violate Mr Smollett’s due process rights. Metro.co.uk have reached out to Jussie’s rep.
Jussie is believed to have now left Chicago. Following news of the charges being dropped, Empire released a statement showing their support for Jussie , who plays Jamal Lyon on the Fox series. Jussie has starred in Empire, alongside Taraji P Henson and Terrence Howard, for five seasons since 2015.